Nest: The nest is built on the ground away from a herbaceous plant. It consists of dry herbs. 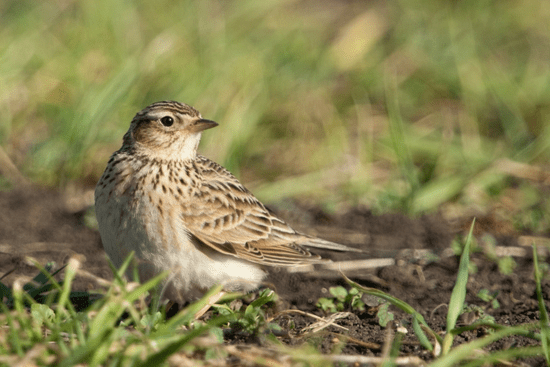 The Skylark migrates day and night. Migratory returns come from early February, when weather conditions are milder. Thus, prenuptial migration begins on February 1st or 4th in Alsace (DRONNEAU and FRAULI, 1990, 1991). In the Massif Central, the return migration begins on February 15th and 23rd and continues until the beginning of March (BRUNET, 1988). There are still passages until the beginning of April. It is not unusual that in the case of heavy snow showers, the earliest migrants are forced to migrate back. These leakage movements can be fast and massive. Postnuptial migration occurs at the earliest in the second half of September and becomes very active only in October, ending in mid-November (YEATMAN, BERTHELOT & JARRY, 1994). The populations of Northern Europe migrate in autumn to the Iberian Peninsula and the Maghreb. CRAMP (1988) locates the lark migration of the lark from September (northern Europe) to November (southern Europe), with a peak in northern Europe in the first half of the year. October. He locates the return migration between January (for southern Europe) and Mars (for northern Europe), with a peak of passage in February.